Ever since it was featured in Roguelike Radio's Episode 15, I have wanted to try Antoine's Quickband. Last weekend I finally got myself to play it. I like the variant's goal; to shorten the Angband's 100 dungeon level experience down to mere 12. 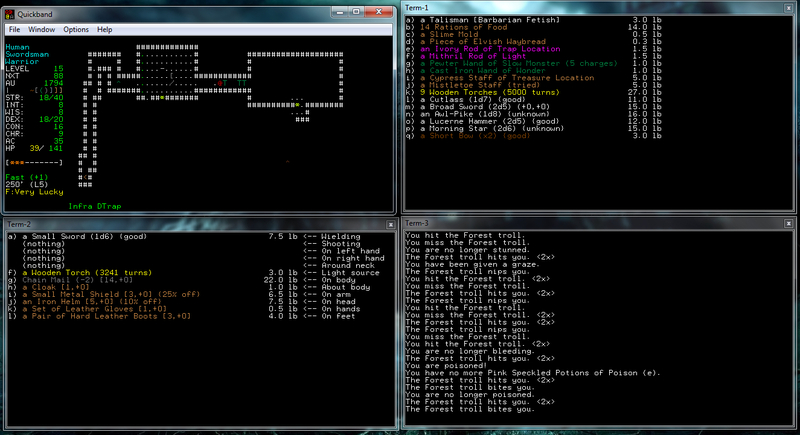 My problem with Angband has always been how I can spend hours on a single character and then quickly die to some monster(s) who uses an attack against which I don't have resistance yet. Deaths seem to happen the same way in Quickband but they definitely come quicker in terms of time played. Dragon breaths seem to have a rather long range, and actual animations (or for some reason I never see them in Angband). Packs of ranged monsters were deadlier as well. Quickband is based on NPPAngband, and guess from it came the things I didn't recognize, like new dungeon features -- I have no idea what standing on NON-NATIVE ground does to my character. 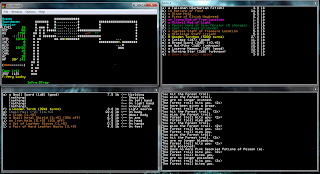 Mostly Quickband seemed to offer a very familiar Angband experience, though, and I think from now on if I ever get the urge to play Angband, I will play Quickband instead.